Special Thread Gauges : Forms like Buttres, Trapezoidal, Acme, Pg, B.A, BSCY, BS cond. in single as Well as multistart can be manufactured in above said dia range. 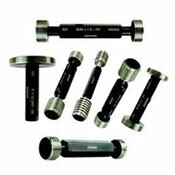 Special Purpose Gauges : Squareness, Concentricity, depth checking, flush pin Gauges & as per drawing Gauges can be manufactured in above said dia. range. Address : 29-B, 3rd Floor & 44, 4th Floor, Vora Building, 59 Nakoda Street, Pydhonie, Mumbai 400 003, Maharashtra, India.